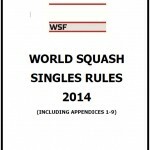 On October 23, 2013 the Annual General Meeting of the World Squash Federation approved a revised version of the Rules of Squash. These updated Rules will come into effect on 1st January 2014. 500) than the current ones (10 000). caused by an accidental act, where the opponent is unable to continue play immediately. there are 5 possible calls). have been added, following consultation with PSA and WSA. Appendix 7 (Court), Appendix 8 (Ball), and Appendix 9 (Racket) for added clarity. further the growth of our sport.